CLEVELAND (AP) — Herb Score, the Cleveland Indians pitcher and former broadcaster whose promise on the mound was shattered by a line drive, died on November 11, 2008. He was 75. Score died at his home in Rocky River, Ohio, the team said in a statement. He had been in a wheelchair since suffering a stroke in 2002, four years after he was seriously injured in a car accident. A hard-throwing left-hander with a big fastball and big heart, Score pitched for the Indians from 1955-59. He was named the American League Rookie of the Year in 1955 after going 16-10. He went 20-9 in 1956 and was twice named to the All-Star team. However, Score's career took a sad and nearly tragic turn on May 7, 1957, when Gil McDougald of the New York Yankees lined a ball off Score's right eye, breaking his nose and a number of bones in his face. As Score lay fallen on the field covered in blood, the public address announcer asked the crowd at Municipal Stadium, "If there is a doctor in the stands, will he please report to the playing field." Fearful of being hit again, Score changed his pitching motion, with less than favorable results. After two losing seasons in Cleveland he pitched parts of three seasons with the Chicago White Sox. He never won more than nine games after the injury and retired in 1962 with a 55-46 record and 837 strikeouts in 858-plus innings. Not long after ending his playing career, Score, a longtime member of ASA, began a second one in baseball when he joined the Indians' TV broadcast team in 1964. He moved to radio in 1968. A native of Rosedale, N.Y., his deep voice and thick New York accent became a fixture for generations of Indians fans. He retired from broadcasting after the 1997 season, his 34th in the booth. "Today is a sad day for the Cleveland Indians family and for Cleveland Indians fans everywhere," president Paul Dolan said in a statement released by the team. "We have lost one of the greatest men in the history of our franchise. Generations of Indians fans owe their love of the Tribe to Herb Score, who was a powerful pitcher and legendary broadcaster. Our thoughts and prayers are with Nancy and the Family." Score was named to Cleveland's 100th anniversary team in 2001. He was inducted into the Indians Hall of Fame in 2006. From the outset, Score showed as much promise as the three future Hall of Famers — Bob Lemon, Early Wynn, and Bob Feller — he joined on the Cleveland staff. In fact, the Indians reportedly refused an offer of $1 million for Score from the Red Sox early in 1957. During his 1955 rookie year, Score recorded 245 strikeouts, a rookie record that stood until 1984 when it was broken by the New York Mets Dwight Gooden. Score followed that up by going 20-9 with a 2.53 ERA and a league-leading 263 strikeouts in 1956. However, the solidly built lefty had an awkward pitching motion that left him vulnerable to balls hit back through the mound. While the Indians languished for decades during Score's broadcasting tenure, his last game ended up being Game 7 of the 1997 World Series. As it turned out, the Indians blew a ninth-inning lead and lost it in the 11th, missing a chance to end a World Series title drought dating back to 1948. As always, Score's last call was simple, accurate and to the point. "Line drive, base hit, the game is over," Score said, summing up Edgar Renteria's series-winning hit off Charles Nagy. Score's personal sendoff was brief, too. "And so that is the season for 1997," he said. "And there's very little else we can say except to tell you it's been a pleasure. I would like to thank all the fans for their kindness over the years. You've been very good to me. And we hope that whoever sits in this chair next, you'll be as kind to them as you have been to me." Score's subdued style was perfect for fans who couldn't afford to take their pitiful Indians too seriously. Like the late Harry Caray, Score was especially beloved for his ability to gracefully gloss over mistakes ("Swing and a miss, it's fouled back to the screen."). 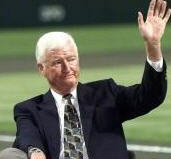 "Herb told the truth the way he saw it," said former Indians manager Mike Hargrove, who once called Score "the ultimate been-there, done-that guy." Later in life, Score suffered additional setbacks. He was injured in a traffic accident, incurring a brain bruise and broken ribs when his car collided with a tractor-trailer. Score is survived by his wife of more than 40 years, Nancy, and three children.